Skills-based routing (SBR), or Skills-based call routing, is a call-assignment strategy used in call centres to assign incoming calls to the most suitable agent, instead of simply choosing the next available agent. It is an enhancement to the Automatic Call Distributor (ACD) systems found in most call centres. The need for skills-based routing has arisen, as call centres have become larger and dealt with a wider variety of call types. In this respect, skills-based routing is also based on call distribution to agents through waiting queues, but one or many skills can be assigned to each agent, and call can be distributed to the most suitable agent. 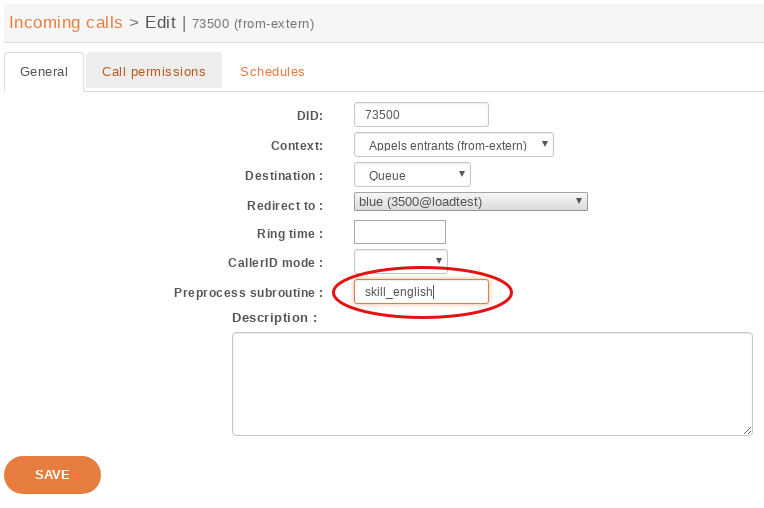 In skills-based routing, you will have to find a way to be able to tag the call for a specific skill need. This can be done for example by entering the call distribution system using different incoming call numbers, using an IVR to let the caller do his own choice, or by requesting to the information system database the customer profile. Note that you shouldn’t use skill based routing on a queue with queue members of type user because the behaviour is not defined and might change in a future XiVO version. Skills are created using the menu Services ‣ Call center ‣ Skills. Each skill belongs to a category. First create the category, and in this category create different skills. Note that a skill name can’t contain upper case letters and must be globally unique (i.e. the same name can’t be used in two different categories). Once all the skills are created you may apply them to agents. Agents may have one or more skills from different categories. It is typical to use a value between 0 and 100 inclusively as the weight of a skill, although any integer is accepted. Once skills are created, rule sets can be defined. If the caller has been waiting for less than 60 seconds (WT < 60), only try to call agents which have the skill “english” set to a value higher than 50; otherwise, go to the next rule. Only try to call agents which have the skill “english” set to a value higher than 0. When a new call enters the queue, then it is distributed to Agent A. As long as Agent A is available and doesn’t answer the call, the call will never be distributed to Agent B, even after 60 seconds of waiting time. When another call enters the queue, then after 60 seconds of waiting time, this call will be distributed to Agent B (and the first call will still be distributed only to Agent A). The reason is that there’s a difference between a call that is being distributed (i.e. that is making agents ring) and a call that is waiting for being distributed. When a call is being distributed to a set of members, no other rule is tried as long as there’s at least 1 of these members available. When a new call enters the queue, then it is immediately distributed to Agent B. The reason is that when there’s no logged agent matching a rule, the next rule is immediately tried. Each part contains an expression composed of operators, variables and integer constants. ‘!’ is the operator with the higher priority, and ‘|’ the one with the lower priority. You can use parentheses ‘()’ to change the priority of operations. The waiting time (WT) is the elapsed time since the call entered the queue. The time the call pass in an IVR or another queue is not taken into account. The estimated waiting time (EWT) has never fully worked. It is mentioned here only for historical reason. You should not use it. It might be removed in a future XiVO version. The skill part can reference any skills name as variables. Then every $lang occurrence will be replaced by ‘german’. Then, for an agent which has the skill english defined, the result of this expression is always true. For an agent which does not have the skill english defined, the result of this expression is always false. Said differently, an agent without a skill X is not the same as an agent with the skill X set to the value 0. This behaviour applies to every comparison operators. A skill rule set is attached to a call using a bit of dialplan. This dialplan is stored in a configuration file you may edit using menu Services ‣ IPBX ‣ Configuration Files. In the figure above, 3 different languages are selected using three different subroutines. Each of this different selections of subroutines can be applied to the call qualifying object. In the following example language selection is applied to incoming calls.